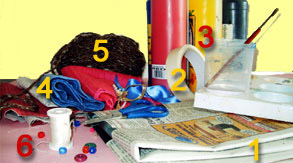 Can You Make A Hand-Puppet? Did you know you can make a hand puppet using masking tape and newspaper? edge of them to the side of your desk so you can pick them up easily. Wrap a strip of newspaper around your index and middle finger. Secure with masking tape. Add another one, but don’t have it exactly on top of the first — vary the direction slightly. Secure with masking tape. Continue in this way, keeping your two fingers inside the shape. Go on — be adventurous — make your puppet look dramatic! Place some strips over the top of your fingers to form the top of the puppet’s head. Place some strips along the base to strengthen it and all around the top. Tear more strips of newspaper and masking tape as you need them. Continue in this way until the head is about the size of an apple. Fold small pieces of paper and stick onto face to create features. Go on-be adventurous — make your puppet look dramatic! When you are happy with your puppet’s face use school paint to mix the colours you need to paint it. Add details. Will your puppet have a hat? Hair? Hairband? Moustache? Beard? Glasses? Earrings? What materials will you use to make these? Make a costume for your puppet using old fabric. Cut out a t-shirt shape, with a long neck, big enough to slip over your hand and wrist. Sew the seams. Decorate with beads, buttons, sequins or whatever you wish. Slide the costume over your hand and wrist, putting your thumb through one arm-hole and your 4th and small finger through the other. The puppets head fits on your index and middle finger. Have fun!